ANDERSON, William Robert, a Representative from Tennessee; born in Bakerville, Humphreys County, Tenn., June 17, 1921; attended the public schools in Waynesboro, Tenn.; graduated from Columbia Military Academy, Columbia, Tenn., 1939; graduated from the United States Naval Academy, Annapolis, Md., 1942; United States Navy, 1957-1962; participated in eleven submarine combat patrols in the Pacific; awarded the Bronze Star and other combat awards; commanding officer of the Nautilus, the first atomic submarine, 1957-1959; made the first transpolar voyage under ice; served as assistant to Vice Adm. H. J. Rickover; consultant to President Kennedy for the National Service Corps, 1963; author; elected as a Democrat to the Eighty-ninth and to the three succeeding Congresses (January 3, 1965-January 3, 1973); unsuccessful candidate for reelection to the Ninety-third Congress in 1972; business executive, Public Office Corporation, Washington, D.C.; died on February 25, 2007, in Leesburg, Va.
Ralph Nader Congress Project. 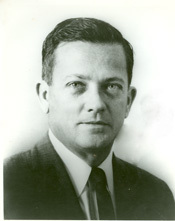 Citizens Look at Congress: William R. Anderson, Democratic Representative from Tennessee. Washington, D. C.: Grossman Publishers, 1972.